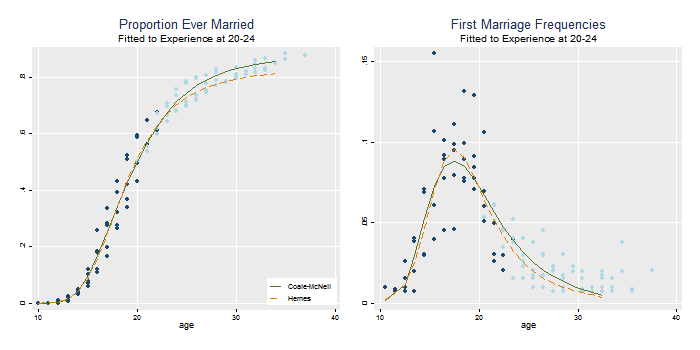 We apply nuptiality models to age at marriage in Colombia using WFS data. The main objective is to show the use of models to extrapolate from incomplete cohort experience. Next we compute cumulative model schedules. The estimates for the Coale-McNeil model were obtained from the paper by Rodríguez and Trussell (1980), who report a mean of 20.4, a standard deviation of 5.4, and a proportion eventually marrying of 89%. The estimates for the Hernes model were computed using a similar maximum likelihood procedure, and yield an "attractiveness" parameter of 0.65 (at age 15), a decay rate of 0.15, and a proportion eventually marrying of 89%. 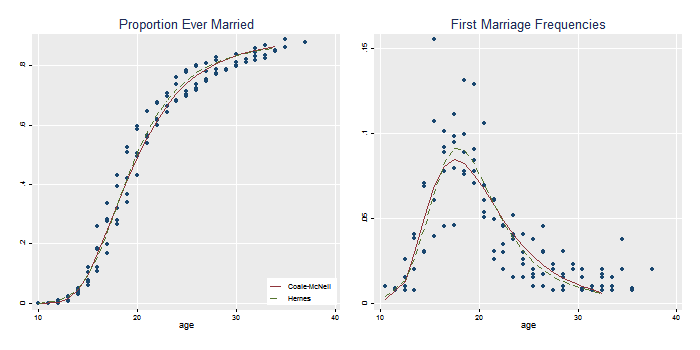 Given the parameters, the schedules temselves were computed using the nuptfer packages for Stata and R. The cumulative schedules were then differences to obtain marriage frequencies by age. The general fit of the models to noisy data is excellent. 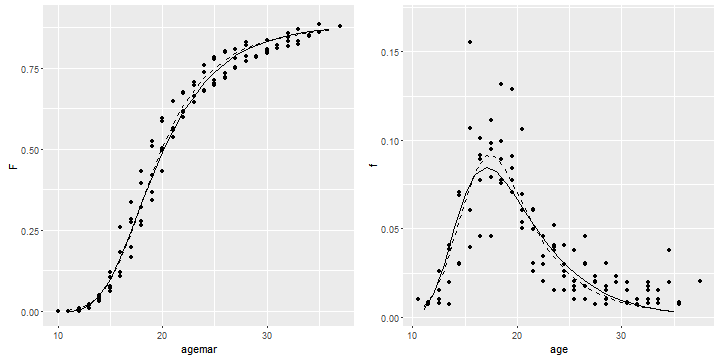 As usual, it is easier to appreciate differences working with densities rather than with cumulative distributions. The Hernes model leads to a distribution a bit more peaked than the Coale-McNeil (dashed and solid lines respectively). We will now simulate what would have happened if we had interviewed these cohorts 15 years earlier. We assume women who had married by then would have reported the same age at marriage, but the rest would have reported themselves as never married. To emphasize how little data we would have, I have redraw the plot below using a different color for data points "in the future". Rodrguez and Trussel (1980) fitted the Coale-McNeil to the censored cohort and obtained a mean of 20.2, a standard deviation of 5.1 and an estimated 87% eventually marrying. The fact that the estimates obtained when the cohort was 20-24 are so close to the estimates obtained when it was 35-39 is nothing short of remarkable. I wemt ahead and fitted the Hernes model to the same censored experience and obtained an attractiveness parameter of 0.73 (at age 15), a rate of decay of 0.18 per year, and a proportion eventually marrying of 83%. It seems clear that the Coale-McNeil does a better job predicting in this particular case. 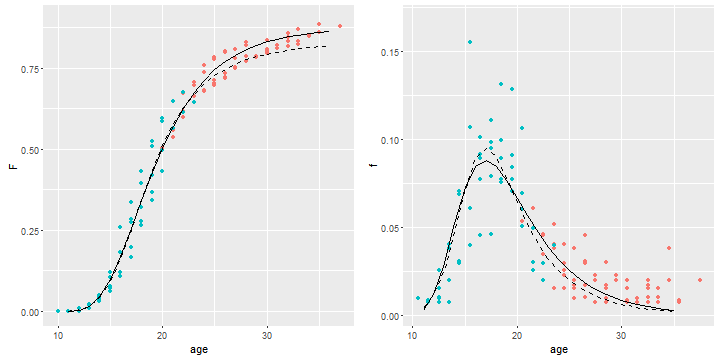 The Hernes model appears to adapt too well to the data at the younger ages, and as a result doesn't predict as well for the older ages. Things don't always work this well. As shown in my paper with Trussell, the data for the oldest cohort, 45-49, are a bit more noisy and the prediction from the cohort's early experience is not as good. Trying to predict the future course of nuptiality is a risky business, and all models rely on the basic assumption that the past says something about the future.